As of last Friday, we’ve been living in Iowa City for a year. I thought about making cupcakes to celebrate the occasion, but alas, I made them instead for a co-worker’s birthday and was too cupcaked out to repeat the process for myself. I thought about making a cake, but then I realized I just made cupcakes, which are too similar and therefore, I was caked out, as well. So instead, I decided to celebrate with a galette. Naturally. 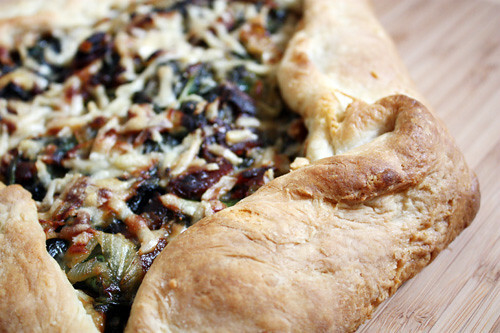 What is a galette, you ask? I haven’t figured it out entirely myself, either, but it’s something of a rustic tart or pie. It’s made with a lot of butter and a lot of work — er, love — and can be filled either with sweet or savory fillings. Being that I was done with all things sweet for a while (see above, cupcaked out), I opted for the latter and, also being that we had a hefty helping of bacon from a local farm just begging to be cooked and eaten, I added that to the mix. Followed by spinach, an onion and a generous chunk of sharp Parmigiano-Reggiano, it was the perfect thing to tuck into a buttery, soft pastry accompanied by roasted artichoke and a glass (or two) of Riesling. Now, about the work: I’ve never been a huge fan of making my own tart and pie crusts. Something about trying to chop frozen butter into tiny, tiny pieces always proves a challenge. Nevertheless, it’s a challenge that is always worth undertaking, especially when the end result is of the buttery kind. A year ago, I was (barely) making ends meet. Today, I’m making galettes. I think things are looking up. In the bowl of a stand mixer, combine flour and salt. Place butter in a separate small bowl. Place both bowls in freezer for one hour. Remove bowls from the freezer and make a well in the center of the flour. Pour butter in the center and, using whisk attachment on the stand mixer, whisk the butter into the flour until the mixture resembles a coarse meal. In a separate small bowl, whisk together water, sour cream and lemon juice. Make a well in the center of the flour-butter mixture and add half the sour cream mixture. Using your fingers, mix the wet ingredients into the dry ingredients, removing the large lumps that form. Make another well with the remaining flour-butter mixture and pour in the rest of the sour cream mixture, mixing the rest of the ingredients together into large lumps. Pat the large lumps together into a ball, cover it in plastic wrap and refrigerate for one hour. Preheat oven to 400 degrees. 15 minutes before pastry is fully refrigerated, pour olive oil into a large skillet over medium heat. Slice onion and add to the skillet. In a separate medium skillet, cook bacon slices until they reach desired crispiness. Saute onions until lightly brown, then add spinach and cook until just wilted. Place onion-spinach mixture in a colander to remove excess olive oil, then place mixture in a medium bowl. Crumble bacon and add to onion-spinach mixture and combine. Remove pastry dough from refrigerator and, on a lightly floured baking stone or back of a baking sheet, roll out dough into a large, thin circle, about 12 inches in diameter. Sprinkle half of the cheese onto the dough. 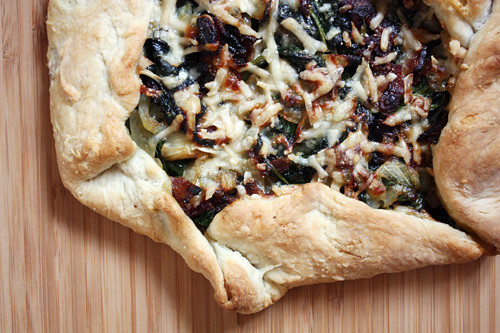 Place the bacon-spinach-onion mixture in a mound in the center of the dough, spreading it about 8 inches wide. Sprinkle remaining cheese on top. Fold edges of galette over, pleating as you go along. Place galette in oven and bake 30-40 minutes, or until dough is a golden brown. Slice and serve. 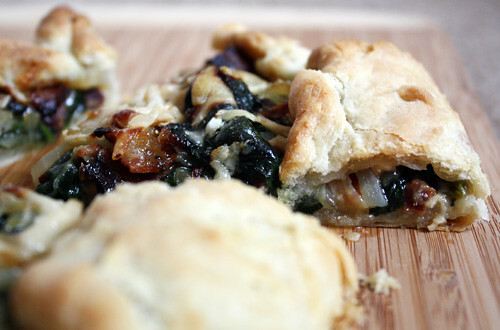 I just bought a nice bunch of kale and was thinking of tweaking a recipe I was developing last week, but maybe I’ll take a break from that and try your galette, but swapping in kale instead. It looks SO good! m.d.kitchen — Mmm, sounds good! I’ve never cooked with kale before (I know, crazy). Hope it turns out great!